Thanks for stopping by for Menu Plan Monday! Hope to see you next week! Art education is one of those areas I struggle with. I am one of those non-artistic people. I tried to do one of those “paint nights” with my girlfriends and my painting was terrible!! However, I believe arts education is important, and necessary when a child is in high school. So, I was happy to get to review the monthly plan from Creating a Masterpiece with my 10th grade son. Creating a Masterpiece offers online art education for students of all ages. There are programs to suit younger and older kids, and you can choose different projects and mediums to explore. Projects range from Beginner level (which are usually one lesson) to Level 5, which may be three lessons or more for one project. Students can experiment with watercolor, acrylic, sculpting, charcoal and pencil drawings, pastels and more. Each lesson features step by step video instruction, and the teacher is very clear, with a pleasant demeanor. This is especially important for my son, who easily loses interest when an online teacher speaks in a monotone voice and goes on and on. You can tell the instructor enjoys art and is enthusiastic about the projects. My son wanted to get into the pencil and charcoal drawings, so that is where we started. We did need to pick up some supplies like a drawing pad, different types of pencils, and some other things, but I was able to find them at a local art supply store for a minimal cost. I really like the fact that you can search for projects by medium and that the necessary supplies are listed for each project. This makes it easy for me to see what you need, and, if you are on a budget, you can choose projects that do not need expensive supplies. The first project my son chose consisted of four lessons, which we did over four days. Each session was further broken down into sections of 10 minutes of less, which is great for kids with short attention spans. It also makes it easy to pick right back up where you left off if you are having a busy day and only have time for a short lesson. My son felt the lesson was easy to follow and enjoyed working on his art projects. I would like him to move more into the pastels and watercolor in the future, but for now, pencil drawing is his thing, and that’s okay. 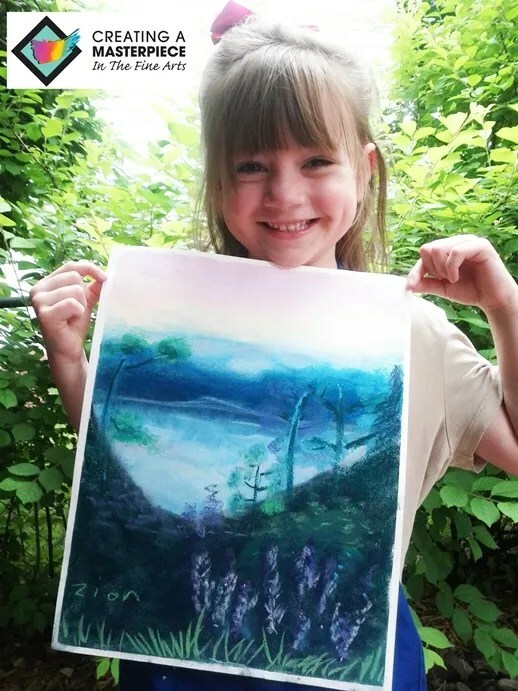 If you have a child who loves art, you can allow them to choose the medium they are most interested in. 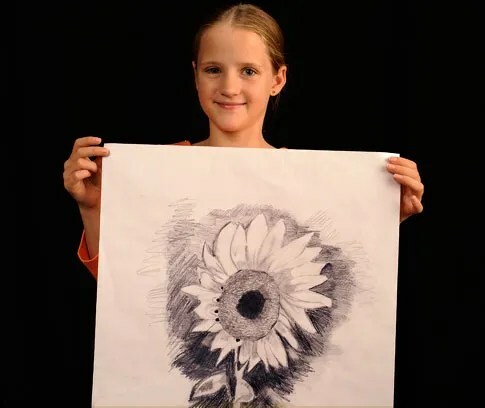 If your child isn’t really into art, but you want to get them started, you can begin with the simpler projects (like the pencil and charcoal drawings) and then encourage them to try out other forms as they get more comfortable. Creating a Masterpiece also includes a section on Art History, which we found pretty interesting and would be a great place to kick off a further study of art in general. For a high school student you could easily add books and trips to the museum and essays about art history along with the projects if you wanted to beef it up. As a kid, I loved to write. Seriously, I was a journaler, and creative writer, and an editor for my school paper. I always seemed to have a story in my head at all times. So, it is hard for me to understand why writing is so hard for my youngest. He loves to tell stories, but when it comes to writing them, well, it’s a challenge. For that reason, I was happy to give Creative Freewriting Adventure from Home School Adventure Co. a try. 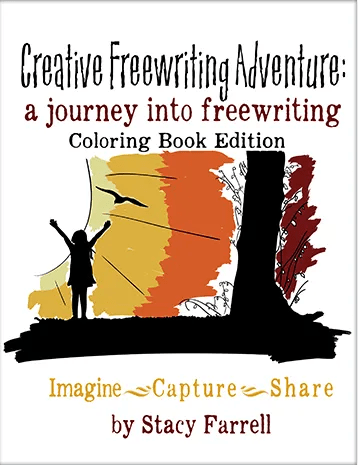 It also comes with the Creative Freewriting Adventure Coloring Book Edition. This program can be used on its own or along with Philosophy Adventure. I just used it as a supplemental writing curriculum for my son. The goal of Creative Freewriting is simple: get kids to write. Really, it’s that easy. The writing prompts are designed to peak your child’s interest and include background information on the subject as well as questions designed to encourage their creativity. 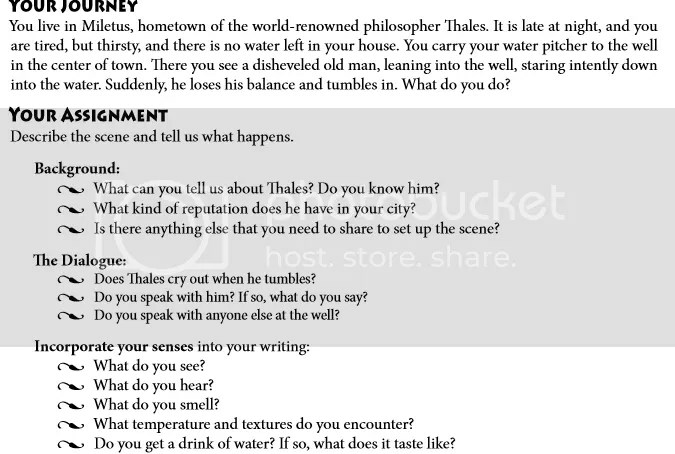 Creative Freewriting features prompts based on the lives of famous astronomers and philosophers (like Thales) as well as stories such as The Wise Woman. However, the prompts include fun twists that make the writing really interesting and students are encouraged to put their own spin on familiar ideas. I think this is actually a really strong component of the program, especially for reluctant writers like my son. 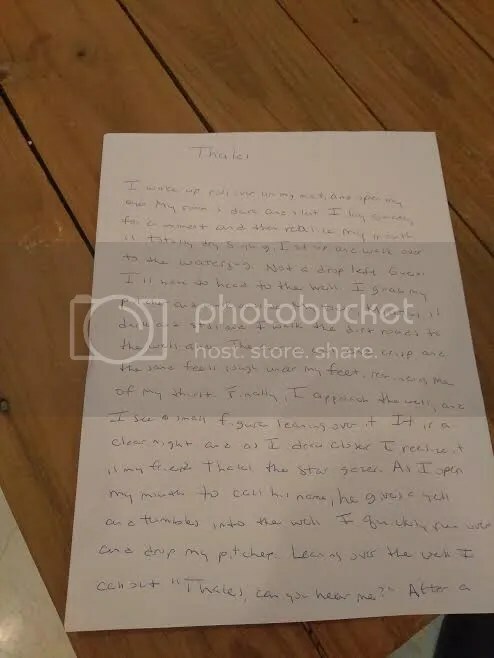 One of his biggest complaints is that he can never think of “what to write”. 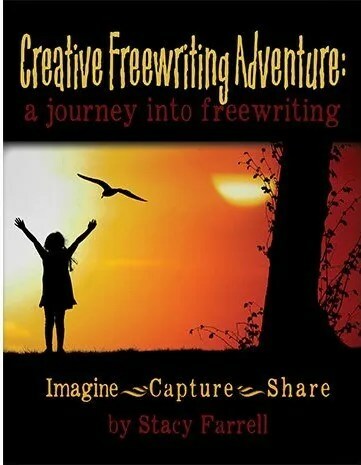 With Creative Freewriting Adventure, he was given just enough structure to get started, but was then able to go off and create a story on his own. I found the background information given in the prompts useful as well. If you wanted to, you could easily choose one prompt a week and use it as a starting point for a further study of a particular philosopher, or use one of the books in the program as a read aloud. For my son, just getting writing was enough. The 15-minute time period is also perfect for our situation because it gave my son an “out” to the writing. He knew he didn’t have to worry about completing the whole story, and that it wasn’t going to be graded for spelling or anything. He just needed to write whatever came to mind. When using this program, I really saw him begin to relax when he wrote for the first time. In fact, there were some stories that he went back and finished on his own after his time was up just because he wanted to! The questions that go with the prompts serve as gentle guides to give your kids ideas for what to write about, but they can also serve as starting points for literature lessons for your kids. For example, when they ask your child to think about “what do you see?” “what do you hear?”, “what do you smell?” you could use that to talk to your child about setting in a story. 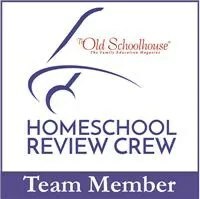 There are also questions that relate to topics like dialogue, character development and more. The coloring book that comes with Creative Freewriting complements the program. It gives students scenes to color that go along with each prompt, which may also help get their creative juices flowing. My son is not much of a colorer, but I think you could also use this if you have a younger student that likes to “tag along” on an older brother or sister’s work. They could listen to you read the background info and prompts and then color the picture and maybe tell you their own story orally! Thanks for stopping by for Menu Plan Monday! I hope things calm down soon. Have a great week. Wash all produce. Chop the cilantro. Dice the garlic. Shred the cabbage. Combine the coleslaw mix, red cabbage, cilantro, and garlic in a large bowl. In a smaller bowl, mix the mayonnaise and hot sauce until well blended. Stir the mayonnaise mixture into the coleslaw mixture. Season with salt and pepper to taste, then cover and chill for at least 30 minutes before serving.